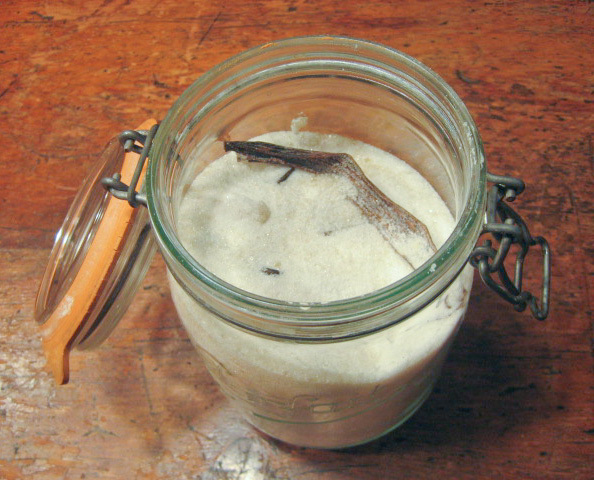 I’ve had jar of vanilla sugar in my kitchen since 1990 and use it for everything from tea to cookies. It adds a nice touch to just about any dessert and can add a subtle hint of vanilla to fruit compotes and preserves. The options are endless and it’s probably the easiet recipe on my site. Vanilla beans can be expensize and often recipes only call for using the seeds. Unfortunately, most people end up throwing away the outer skin which still has a lot of vanilla flavor to impart. To get the most our of your investment, just fill a jar that has a rubber seal with sugar and add the vanilla bean skins. Give it a good shake and in just a day or two you will have heavenly scented vanilla sugar. As you use the vanilla sugar, just add more plain sugar to the jar. The vanilla skin will impart flavor for a very long time. Every time you use a bean, just throw the new skin into the mix. Even if you don’t use vanilla beans in your cooking, Costco sells a nice pack of beans for about $10 or so. They will last forever and you can use them just for making this sugar. To remove the seeds from the vanilla bean, use a paring knife to cut along the length of the bean. Fold the bean open and use the tip of a spoon to scrape out the seeds. The seeds can be used to flavor custards, icecream, and any dessert simmered on the stove. Put them in you chocolate chip cookies for an extra vanilla punch. Even if you never make homemade anything, you can throw them into a boxed cake or brownie mix instead of throwing them away.